World's Regard For U.S. Leadership Hits Record Low In Gallup Poll : The Two-Way The global approval rating for U.S. leadership fell to 30 percent — lower in President Trump's first year in office than under former President George W. Bush, and a sharp fall from the Obama era. Approval of U.S. leadership fell sharply in President Trump's first year — particularly in Canada, where the approval rating fell from 60 percent to 20 percent. In this photo, protesters demonstrate at a new Trump International hotel in Vancouver last year. The global approval rating for U.S. leadership now stands at 30 percent — lower in President Trump's first year in office than it was under former President George W. Bush, according to the Gallup World Poll. The image of America's leadership now trails both Germany and China, Gallup says. 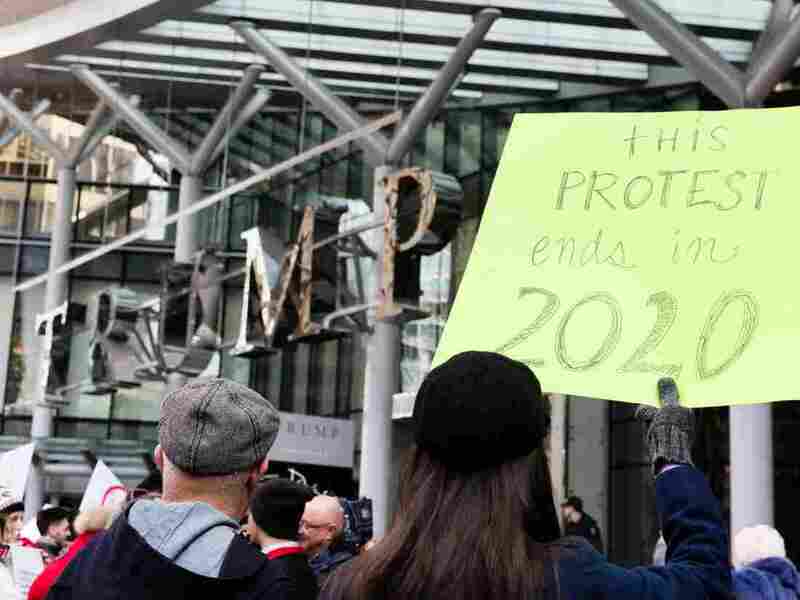 International regard for U.S. leadership fell sharply from the 48 percent approval rating for 2016, former President Barack Obama's last year in office. The previous low of 34 percent was reached at the end of the Bush administration. The new survey was conducted between March and November of 2017. Gallup found that approval of U.S. leadership had fallen by double digits in nearly half of the 134 countries and areas it surveyed. The Gallup report also cites another record: for disapproval. Worldwide, a median 43 percent disapprove of U.S. leadership — more than the median disapproval for Germany (25 percent), China (30 percent) or Russia (36 percent). According to Gallup, that's a record for any major world power, not just the U.S., in the past decade. Some of the biggest declines were seen in countries that are America's closest neighbors, trade partners and allies. The U.S. approval rating fell by 40 points in Canada (from 60 percent to 20), for instance, and by 28 points in Mexico (from 44 percent to 16), Gallup says. Across North and South America, U.S. leadership now has a 24 percent approval rating — less than half of the 49 percent that was reported in Obama's last year in office. 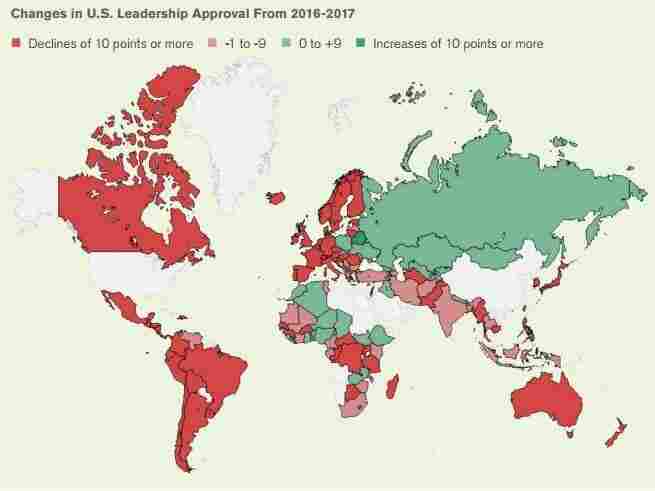 In 2017, approval of U.S. leadership fell by double digits in nearly half of the 134 countries and areas surveyed by Gallup. Approval for U.S. leadership increased by 10 points or more in four countries: Liberia, with 17 percentage points; Macedonia, with 15; Israel, with 14; and Belarus, with 11. "Africa as a whole remained the bright spot for U.S. leadership approval, as it has been for the past decade. Nonetheless, the approval rating for the region is at its lowest level yet, clinging to a bare majority (51 percent) that may be at risk after the president's alleged remarks about the continent last week."